In recent years there have been a number of studies proposing millennium-scale climate cycles. Fred Singer and Dennis Avery believe there is an unstoppable 1,500 year cycle. Evidence of the global nature of the 1,500-year climate cycles includes very long-term proxies for temperature change — ice cores, seabed and lake sediments, and fossils of pollen grains and tiny sea creatures. There are also shorter-term proxies — cave stalagmites, tree rings from trees both living and buried, boreholes and a wide variety of other temperature proxies. Charles Perry and Kenneth Hsu believe there is “1,300-year little-ice-age cycle”. The approximate 1,300-year little-ice-age cycle and intervening warmer periods agree with archaeological and historical evidence of these cold and warm periods. Throughout history, global warming has brought prosperity whereas global cooling has brought adversity. Gerard Bond believes there is a 1,470-year climate cycle in the Holocene. Unfortunately, the identified millennium-scale climate cycles are not very predictable. For example, Bond Events happen every 1,470-year plus or minus [about] 500 years. Additionally, the identified millennium-scale climate cycles can be rather elusive. For example, Bond Events display “nonlinear behavior and stochastic resonance” whereby “not every instance of the pattern is a significant climate event”. The hypothesis holds that the 1,500-year cycle displays nonlinear behavior and stochastic resonance; not every instance of the pattern is a significant climate event, though some rise to major prominence in environmental history. 1) Generally, researchers are blindly searching for cycles hidden within the data. More specifically; they are not researching a specific cyclical mechanism. 2) Researchers are working with proxy reconstructions of climate [not the real thing]. Each proxy [and reconstruction] has its own specific issues but researchers will usually encounter some issues regarding calibration and dating accuracy, temporal resolution, hidden assumptions and computer modelling. 3) Researchers generally adhere to the gradualist belief that “the present is the key to the past” where “the past” functions in the same manner as “the present”. Unfortunately, this gradualist approach becomes an oxymoron when researchers are hunting for dramatic millennium-scale climate cycles. But the reasons are really very clear. Firstly, the dating of the Greenland ice cores are speculative guesses [supported by computer modelling]. Secondly, Bond Events are “average” 1,470 year events [plus or minus 500 years] that do reflect significant frequencies in the data [see below]. Overall, as my father used to say: two wrongs don’t make a right. However, the mysteries of the millennium-scale climate cycle can be unravelled in a few short steps. The first piece of the puzzle is established by analysing [in an Excel spreadsheet] the orbital distances and orbital periods of the planets in the Solar System using modern observational data [Planets – A Very Short Introduction by David A Rothery – Oxford University Press – 2010]. The resulting Excel “Power” trend line generates a perfect fit with the planetary data. The second piece of the puzzle was provided by the Voyager 1 spacecraft [in 2012] when the spacecraft delivered a “reality check” to astronomy by leaving the Solar System at a distance of [only] 122 AU [from the Sun]. The Voyager 1 spacecraft is a 722 kilogram (1,592 lb) space probe launched by NASA on September 5, 1977 to study the outer Solar System and interstellar medium. Operating for 35 years, 1 month and 23 days as of 28 October 2012, the spacecraft receives routine commands and transmits data back to the Deep Space Network. At a distance of about 122 AU (1.83×1010 km) as of September 2012, it is the furthest manmade object from Earth. Voyager 1 is now in the heliosheath, which is the outermost layer of the heliosphere. On June 15, 2012, NASA scientists reported that Voyager 1 may be very close to entering interstellar space and becoming the first manmade object to leave the Solar System. While there’s no official word from NASA on this, the buzz around the blogosphere is that Voyager 1 has left the Solar System. The evidence comes from this graph, above, which shows the number of particles, mainly protons, from the Sun hitting Voyager 1 across time. The final piece of the puzzle is calculated in Excel by extending the orbital period trend line out to 122 AU to discover the heliosphere orbital period of 1,350 years. Having calculated that the heliosphere takes 1,350 years to complete one full rotation we can now begin to search for supporting evidence that might indicate the existence of 1,350 year cyclical events and [possibly] a half-period event at 675 years [because I like to keep my polarised electromagnetic options open]. Interestingly, there is supporting cyclical evidence within the Solar System [referenced by John Stockwell in 1901] that indicates there is a 1,350 year eclipse-cycle [involving the Earth and Moon orbiting around the Sun]. Bringing the astronomical 1,350 year cycle right down to Earth is a reconstruction of the Earth’s geomagnetic axial tilt which identifies “a dominant 1350-year cycle in the dipole tilt variations”. In the field of climate the Indian Summer Monsoon Variability has a significant periodicity at 1,3500 years. The 1350 year cyclicity is similar to the enigmatic “1500 years” periodicity first observed in the North Atlantic ice rafted debris (IRD) records, which reveal a cycle of 1340 ± 500 years, believed to be influenced by variations in the solar energy output (Bond et al., 2001). Although the existence of such cycles in the North Atlantic climatic regime has been disputed, similar cyclicity has been reported not only in the high latitudes, but also in low latitude monsoon domains (Mayewski et al., 1997; Gupta et al., 2005). The climate effects of the 1,350 year cycle are also found in China where “there is a reoccurring periodicity of 1350 years in temperature change”. Returning to Gerard Bond’s 1997 study of the North Atlantic we find that the father of the Bond Event actually encountered the 1,350 year cycle. In fact, the 1,350 year cycle was “head and shoulders” above the other two cyclical peaks [at 4,670 and 1,800 years] in the “Confidence Level F Test” performed by Gerard Bond. Finally, spectral analysis of the time series of hematite-stained grains by the multitaper method of Thompson (29) reveals that power is concentrated in two broad bands. One is centered at ;1800 years, near the mean of Holocene-glacial events, and the other is centered at ;4700 years (Fig. 7C). Cycles close to both have been noted previously in spectra from other paleoclimate records from the last glaciation (30). In addition, F variance ratio tests reveal lines with .95% probability at 4670, 1800, and 1350 years (Fig. 7C). Further corroboration of cyclicity close to the mean of the IRD events is given by applying a broad Gaussian bandpass filter to the record of hematite-stained grains centered on 1800 years (Fig. 7D). If you are wondering about the 4,670 and 1,800 year cyclical periods then Charles Keeling and Timothy Whorf think they are “associated with gradually shifting lunar declination from one episode of maximum tidal forcing on the centennial time-scale to the next”. We propose that such abrupt millennial changes, seen in ice and sedimentary core records, were produced in part by well characterized, almost periodic variations in the strength of the global oceanic tide-raising forces caused by resonances in the periodic motions of the earth and moon. A well defined 1,800-year tidal cycle is associated with gradually shifting lunar declination from one episode of maximum tidal forcing on the centennial time-scale to the next. An amplitude modulation of this cycle occurs with an average period of about 5,000 years, associated with gradually shifting separation-intervals between perihelion and syzygy at maxima of the 1,800-year cycle. 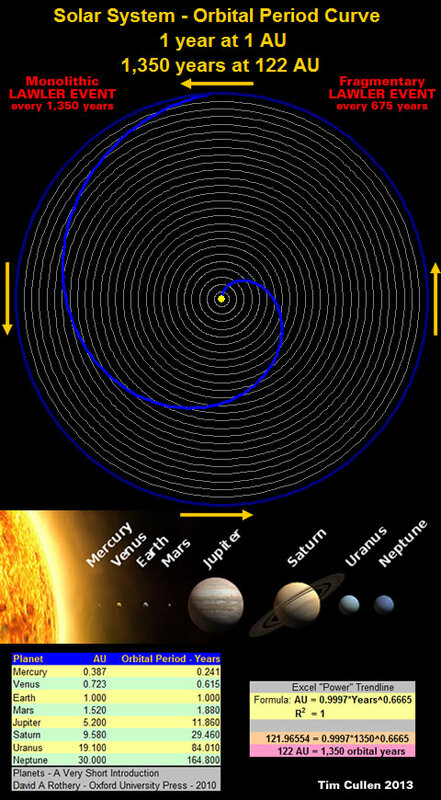 Therefore, it is likely that the primary millennium-scale climate cycles of 1,350 years, 1,800 years and 4,670 years are all controlled by Solar System orbital mechanics. However, our interest in climate cycles is not driven by pure academic curiosity. Climate is a fundamental factor that influences the wellbeing of individuals, communities, regions, countries and empires. There is a pattern of the rise an fall of empires, of whole civilizations, which happens with approximately a 700-year repeat cycle. The cycles alternate with monolithic empires followed by fragmentary empires. There is a complete collapse of civilization each 1400 years, so this could be called a 1400-year cycle. But all major empires rise and collapse every 700 years in synchronism. The importance of the 1,350 year climate cycle becomes interesting when you remember that the Little Ice Age has been “conventionally defined” as starting in 1,350 AD [perhaps there is more to our calendar than meets the eye] because adding on the half-cycle period of 675 years brings us to 2,025 AD. It has been conventionally defined as a period extending from the 16th to the 19th centuries, or alternatively, from about 1350 to about 1850, though climatologists and historians working with local records no longer expect to agree on either the start or end dates of this period, which varied according to local conditions. The Sun experienced a downward “step change” in activity during 2005. A Solar Step Change during late 2005? I have commented on the solar Angular Momentum change that occurs at the same time previously, but today while researching the “L&P Effect” I came across some amazing graphs. The graphs come from a presentation from Nagovitsyn, Pevtsov and Livingston (Bill) that I think displays Russian CRAO spot data that shows all sunspot size groups also experience a step change around late 2005. Therefore, it’s probably correct to say: Welcome to a Lawler Fragmentation Event. Gallery | This entry was posted in Astrophysics, Earth, Lawler Events, Moon, Solar System, Vortices. Bookmark the permalink. I was wondering if that 1,350 year cycle also ties up with other minimums prior to the Little Ice Age. One should actually start with Charles Lyell’s Principles of Geology in which he cherry picked the data, ignored any catastrophic input, and rhetorically moved the fiction of creation from 4004BC (Ussher’s date) to a far earlier starting point. The geological, and hence astronomical chronology was then built on this assumption. Take the Greek and Middle Age Dark ages out (Heinsohn’s theory) and one has a vastly shortened recent history. This makes the Singer etc 1500 year cycle just an imaginary construct, and also reminds me of the Aristotelian cycles on cycles obsession. As for the removal of creation from 4004 BC to 13.8 billion years, that is tantamount to moving a fiction from one point in time to another. Anything inferred from that fictional starting point is a consequent also fiction. (Sorry Darwinists and Creationists, both liberal and fundamental). But before I comment further, it is very obvious to me I have to read everything you have posted here because I suddenly realise you have collated and commented on issues I am presently focussed on. If you work out the Jupiter-Saturn long period using the JPL data it should come to 243148 years. 243148 / 360 = 675.411 years or 34 Jupiter-Saturn conjunctions. Double it for 1350~ years. This is why this ‘special’ king was born as a Lamb of God (Aries) but became a Fisher of Men (Pisces). This royal family have been keeping this astrological tradition for millennia. This is why Egyptian pharaoh of the last month (Alexander the Great, Ptolemy III) were identified with the ram (Aries), while our present popes are identified with a fish (the Fisher Ring). However, these Great Month transitions are based upon standard precession, rather than ‘seasonal’ precession, and so are not directly linked to Milankovitch cycles. Genuine cycles clearly exist. They will be associated with not just one recurring event…..
Filaments that power galaxies grow in power. As they do, the stars alter from Red to Blue. They also get smaller as the pinches are tighter. This is also bound to affect what cycles we may discern on this planet and system wide. Orbits change, planets are added, satellites become planets, planets are destroyed. The star and planetary motions are a load on the force part of EMF. A lesser load will mean more speed. This is very intricate stuff. Writing now, we can say more certainly that we are in a minimum.